ERIM™ is a proprietary management framework aimed specifically at establishing and shaping high-impact corporate intelligence programs with enterprise-wide value protection and strategic decision-support capabilities. Tegumen created this best practice on the basis of decades of experience developing and supporting corporate risk and security intelligence programs. ERIM™ serves as both an assessment tool and a roadmap for functional growth, defining objectives, identifying resources, and developing competencies - from basic delivery of situational awareness to strategic decision support. Risk-centric enterprise functions and departments operate too frequently in silos and according to inconsistent definitions and measurements of risk. 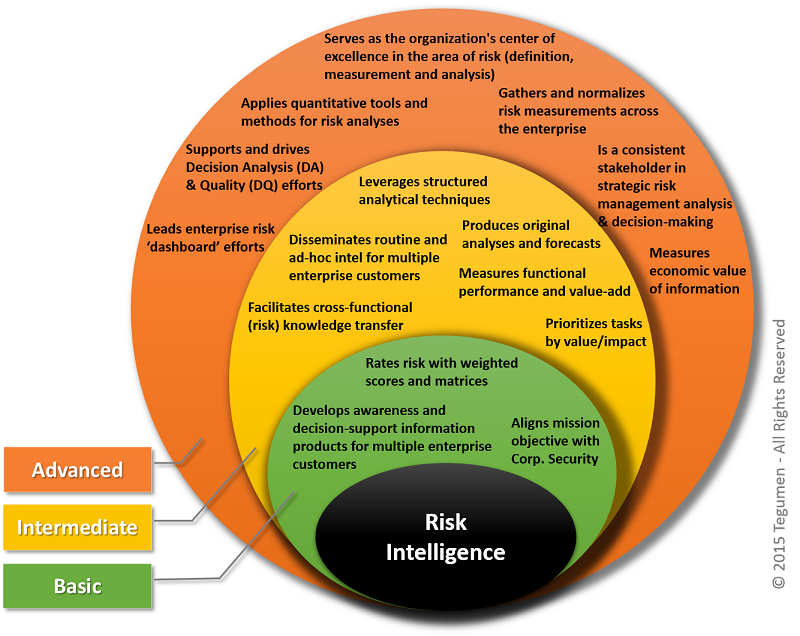 The ERIM™ framework is based on the expansion of legacy corporate intelligence functions to include competencies and subject matter expertise bridging cross-functional risk mitigation initiative and critical decision-making. By integrating knowledge and tools from the fields of decision sciences, probabilistic analysis and information economics, our model elevates the narrow-field corporate intelligence function to an enterprise risk and decision quality center of excellence. Regardless of whether your organization is just developing a risk, threat or security intelligence function, or it already benefits from a large and sophisticated intelligence operation, our team and framework will provide immediate growth and value-generating insights and solutions. Tegumen helps clients design, assess, manage and optimize enterprise risk mitigation and intelligence programs. Contact us today to learn more how we can help your brand achieve risk intelligence maturity.